Today marks the seventy-fifth anniversary of the signing of the Roerich Pact in Washington, D.C., in the White House, with President Roosevelt and his cabinet—and also the representatives of the Roerich Museum—attending. It was a very important occasion; the treaty was signed by all the members of the Pan-American Union, which included almost all the nations of the Americas. Most people are not aware of the background to this event. Helena Roerich revealed, in her letters to President Roosevelt, that there was a Plan to unite the Americas. It was for this reason that one of the major conventions to promote the Pact took place in Montevideo, Uruguay. It was also for this reason that one of the early co-workers of the Roerichs, Frances Grant, who was one of the trustees of the Roerich Museum in New York, was sent on a cultural mission to the major capitals of Latin America, to meet the heads of state and introduce them to the ideas and purpose of Roerich’s work in the West. Ms. Grant took with her a large number of paintings by Nicholas Roerich, and exhibited them in the various capitals, thus bringing awareness of Roerich’s art to an entire new continent. 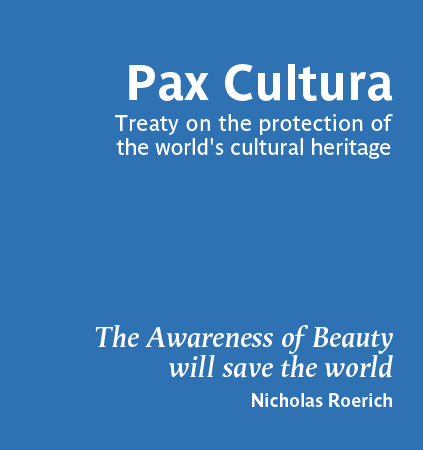 In the archive of Nicholas Roerich Museum in New York, there are many archival materials relating to the Roerich Pact. We have chosen some of these to present here, certainly for the first time to many viewers, so that there may be a fuller understanding of one of the important missions of the Roerichs in the West. The Pact itself is an important force even today, making itself felt all over the world, reminding people of the desperate need for humanity to gain a new respect for its cultural heritage, to value the cultural, scientific, and educational achievements of all nations and commit itself to the preservation of the world’s cultural heritage. The Banner of Peace is the world’s most powerful sign of this mission of humanity. This sign, of ancient origin, is found all over the world. No one can own it, no one can control it. It symbolizes the striving of people everywhere to preserve the best of humanity’s past and of its present achievements. All the best that humanity produces is so often treated with such disregard and destructiveness, such disdain and cruelty, that we must be reminded again and again that we hold the planet in sacred trust. We do not own it, we may not harm it, we must cherish it and preserve it and hand it on to future generations intact, and even enhanced. LA DEFENSA DEL MUNDO CULTURAL. Buenos Aires: Andhra Research University, 1929. LE PACTE ROERICH. BANNIERE DE PAIX. THE ROERICH PACT. BANNER OF PEACE. New York: Roerich Museum Press, 1931. V. Sarti. FOR PEACE AND CULTURE. (Reprinted from "The Maha Bodhi Journal", October, 1933). N. Roerich. BANNER OF PEACE. (Reprinted from "New Haven Teachers' Journal", October, 1933). (Reprinted from the Special Peace Section of The Scholar Annual, 1933). Palghat: The Scholar Press, 1933. THE BIOSOPHICAL REVIEW, No.III, Vol.I, 1933. Peace Issue. ОСЕТIЯ (OSSÉTIE), No. 3, 1933. Журналъ Комитета Осетиновѣдѣнія при Европейскомъ Центрѣ Музея Академика Н. К. Рериха. Bulletin Mensuel du Comité des Études Ossétines près le Centre Européen du Roerich Museum. Спеціальный номеръ Знамени Мира Рериха. J. B. Scott. THE BANNER OF PEACE. (Reprinted from "The Scholar", February 1934). Palghat: The Scholar Press, . ЗНАМЯ МИРА. РУССКИЙ КОМИТЕТ ПАКТА РЕРИХА В ХАРБИНЕ. ОТЧЕТ. [Организационное заседание 5 сентября 1934 года]. by Colonel A. E. Mahon, D.S.O. THE ROERICH PACT AND THE BANNER OF PEACE. The Banner of Peace. November 17th and 18th, 1933, Washington, D.C.
New York: Roerich Museum Press, 1934. Washington, D.C., April 15, 1935. New York: Roerich Museum Press, 1935. V. A. Shibayev. THE ROERICH PACT AND BANNER OF PEACE. H. A. Shah. ROERICH PACT. (Reprinted from "The Maha Bodhi Journal", vol.44, no.11). TREATY BETWEEN THE USA AND THE OTHER AMERICAN REPUBLICS. Washington: United States Government Printing Office, 1936. ROERICH PACT. PEACE BANNER. THE RED CROSS OF CULTURE. Shanghai: Roerich Pact Committee, 1938. Delhi: New World Library, 1939. 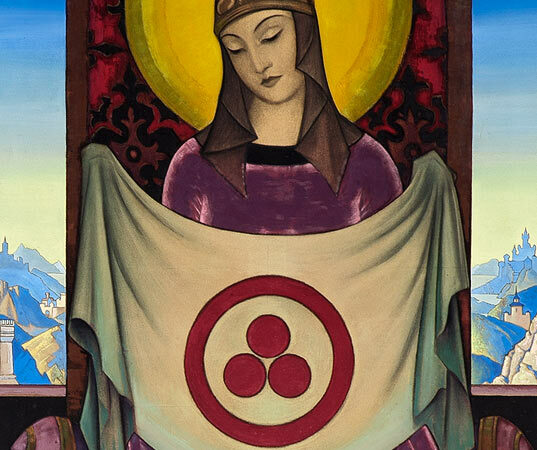 THE ROERICH PACT AND BANNER OF PEACE. New York: The Roerich Pact and Banner of Peace Committee, 1947. FONTI BIBLIOGRAFICHE DEL PATTO INTERNAZIONALE ROERICH. Bologna: Comitato del Patto Internazionale Roerich, 1950.